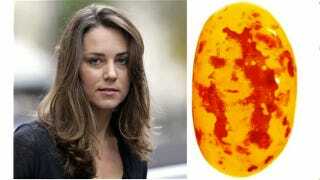 Yes, it's come to this: A British couple are hoping to sell a jelly bean that looks like Kate Middleton for $800. Mr Hosie and girlfriend Jessica White, 24, from Taunton, Somerset, kept the mango-flavoured bean and now plan to sell it on eBay for £500. Mr Hosie said: "As Jessica opened the jar, I saw her immediately. She was literally lying there staring back at me." Literally! At least they're just selling the candy, and not insisting that this is a secret message about Kate needing to be rescued from the clutches of the royal family.